"Obama, after all, agrees with all of Bush's key policies: expanding the police state, destroying the Bill of Rights, waging American imperialism across the world, running secret prisons, accelerating the national debt, bailing out the corrupt banksters and gutting America's working middle class." 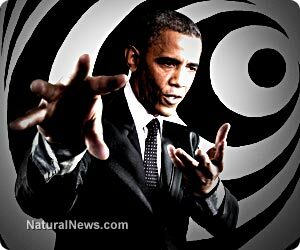 (NaturalNews) Obama's "chemical weapons" claims against Syria are woven from the same fabric as Bush's "weapons of mass destruction" claims against Iraq. That fabric is, of course, fiction. Neither claim has any basis in reality, but they make a great story that can be spoon-fed to the American people by CNN, the Comedy News Network. So now it's in your face, you see: Obama is arming terrorists. Not just any terrorists, but THE terrorists that Bush claimed justified the rise of the entire U.S. police state reach-down-your-pants spy grid security theater apparatus. Isn't it now obvious that the U.S. government runs al-Queda, 1984-style, to make sure America always has a boogeyman to invoke when justifying the destruction of civil rights and individual privacy? This is the kind of insanity you're being subjected to on a daily basis by CNN, NPR, MSNBC and other purveyors of bewildering blather. Only a complete fluoride-headed zombie could buy into the false narratives and the never-ending "mental whiplash" head games being played by the White House. Because in addition to all this nonsense that makes Obama look nearly identical to Bush, we've also got the added bonuses of an IRS that intimidates and oppresses conservative groups, a DOJ that runs guns into Mexico while secretly wiretapping journalists, an NSA that spies on all your electronic activities including phone calls and emails, plus the dark skin pigmentation of the President which somehow allows the leftist media to stupidly label anyone who doesn't agree with Obama's actions a "racist." Obama, in other words, has actually become worse than Bush. No wonder even left-leaning Ralph Nader, a champion of unions and socialist-leaning policies recently asked, "Has there [ever] been a bigger con man in the White House than Barack Obama?"